The thing about Zope is, everyone wants to use it, but most people don't know where to start. Take, for example, something as simple as building a feedback form. For a PHP or Perl developer, this is a doddle, requiring no more than a couple hours of development time (OK, OK, a little more if it requires complex validation or processing). Building a feedback form in PHP or Perl is neither scary or intimidating; in fact, it's one of the most fundamental things a Web developer needs to know to consider himself even reasonably proficient in the language. Put that same PHP or Perl developer on a Zope-based platform, however, and the sweat will really start trickling. Zope's object-oriented approach to everything tends to confuse even the most versatile PHP or Perl programmer, and you can expect that one hour to telescope into a couple of days, as our fearless programmer struggles to master the intricacies of Zope objects, variables and methods. In case you ever find yourself in this situation, you're going to be glad you found this article. Over the next few pages, I'm going to give you a broad overview of the process of building and processing Zope forms, demonstrating how simple and painless the process really is. I'll be assuming that you know the basics of Zope - variables, and the like - and that you have a Zope 2.50 system up and running. In case you don't, drop by http://www.zope.org/Documentation/nuser, get the skinny and then come back for the fireworks. 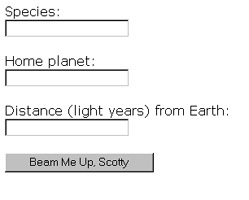 We'll start with something simple, a form with three fields and a form processor that displays the data entered into the form. The first step is to create a couple of DTML Document objects (via the Zope Management Interface, usually available at http://your_zope_server:8080/your_folder/manage) to represent these two items. I've called them Form and FormProcessor respectively; feel free to name them whatever you want. This isn't very hard to read, even if you've never worked with Zope before. It's a standard HTML form, with DTML statements embedded within it (much like a PHP script, which has PHP commands embedded within the markup). If you have some familiarity with Zope, you'll already know about the HTML header and footer objects; they are generic objects that can be used to place a standard header and footer on every page. Enclosed within these is a regular HTML form, albeit one which references another DTML Document when submitted. 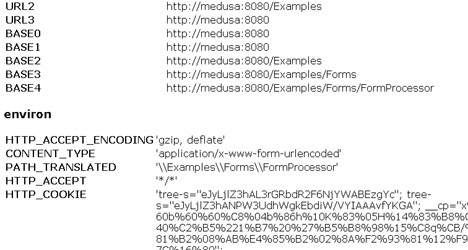 This DTML Document is named FormProcessor, and it's going to handle the task of processing the data entered into the form by the user. Welcome to Earth, <b><dtml-var species></b> from the planet <b><dtml-var planet></b>. How was your journey? Travelling <b><dtml-var distance></b> light years must be quite a shock to the system. Why don't you relax and have a drink? Obviously, there's a lot more you can do with Zope than just this. One of the coolest things has to be the ability to enforce data types and checks on the data entered into a form. If you've ever had to code a form processor, this capability is sure to save you a couple of hours of work. A little scary, but nevertheless effective in communicating the error. Obviously, you can customize this page to your own requirements. In this case, if any of the fields are left empty and the form is submitted to the FormProcessor object, the corresponding DTML variable will never come into existence. 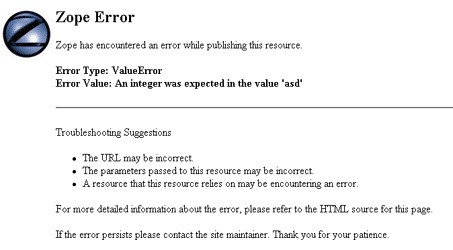 Consequently, the FormProcessor object (which, you will remember, references each of these variables) will raise a KeyError when it attempts to access this non-existent variable. 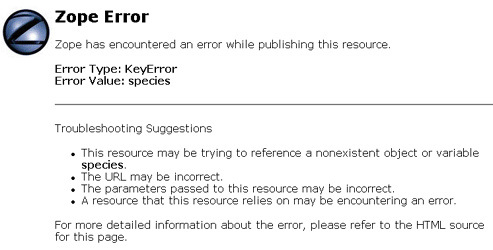 The "missing" attribute sets a default value for the variable in the event that Zope cannot find it, in an attempt to avoid those ugly error messages. The REQUEST namespace contains a whole bunch of environment and Zope variables that you can use for your own dark purposes. These include, among others, the standard variables HTTP_USER_AGENT, HTTP_REFERER and PATH_INFO, Zope-specific variables like PUBLISHED, SERVER_URL, AUTHENTICATED_USER and URL0, and cookie and session data. This ability to access form variables in this manner brings up another interesting item. Thus far, I've been creating individual Form and FormProcessor objects. However, it's also possible to create a combined object, simply by testing for the presence or absence of the "submit" variable. with the special Zope variable "URL0". URL0 is a Zope variable which always holds the name of the current URL (you'll see it in the list of variables displayed within the REQUEST namespace). Using this built-in variable covers you in case you need to change the object name in future. As you can see, this is a simple feedback form for a Web site. When a user submits it, the information entered into it should be automagically emailed to the site's Webmaster. How is this done in Zope? Very simple. First, create a new Mail Host object (I've called mine "LocalRelay"), and assign it appropriate values for your SMTP server. Then, create a FeedbackFormProcessor, which uses this Mail Host object to send the contents of the form to a specified email address. Your feedback was sent successfully. Thank you for your comments! In this case, the <dtml-sendmail> directive is used to tell Zope that the contents of the block are to be sent out as email via the specified Mail Host. You must ensure that the email message includes "To", "From" and "Subject" headers, or else either Zope or your mail server will barf. In addition to these three mandatory headers, you can also specify additional, optional headers, such as "Cc", "Reply-To" and so on. Notice how I've included a few built-in variables in the email message. This is useful to provide the site's Webmaster with some additional information on the client used to send the feedback. 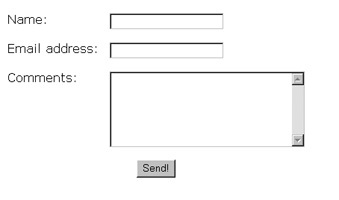 Once the email message has been sent, a message is displayed to the user confirming message delivery. If you're going to be using a lot of feedback forms, you might want to consider making the recipient email address a property, so that you can refer to it as a variable rather than hard-wiring it into the DTML Document code itself. This article was first published on 22 Feb 2002.